Wondering why the contractor you hired to work on your house never showed up or why your car keeps hitting potholes on Interstate 440 and other roads across Nashville? The answer is visible above the city’s skyline, where cranes loom over high-rise buildings that seem to be going up in every direction. The region is experiencing a surge in construction of new offices, apartments, condominiums and health care facilities. At the same time, demand is growing for more single-family homes for the 100 or so people moving to the region every day. Meanwhile, the state’s roadbuilders are busy addressing a $10 billion backlog in highway repairs, and all of those projects are competing for a commodity that is, more than ever, in short supply. There are not enough electricians, plumbers, carpenters and other skilled workers to go around. -- The $430 million Fifth + Broadway mixed-use development, on the site of the city’s old convention center, will have 230,000 square feet of retail space, a 34-story residential tower and a 26-story office tower as well as the National Museum of African American Music. -- 505, the 45-story high-rise located at Fifth Avenue and Church Street, has 543 residences. It is valued at $169 million. -- The $160 million Tennessee State Museum, under construction at Bicentennial Mall, will have 140,000 square feet of space. -- The four-floor expansion of Vanderbilt’s Monroe Carell Jr. Children’s Hospital is adding 160,000 square feet of space. The project is valued at more than $100 million. Other projects at Vanderbilt include a $26.3 million building for the School of Nursing. -- Novel Music Row, a residential building on Division Street, is valued at $161 million. -- City Lights, with 71 luxury condos and restaurant space on Rutledge Hill south of downtown, is valued at $73 million. The city of Nashville approved building permits valued at more than $3.6 billion last year, second only to the more than $3.9 billion in permits issued the year before. Construction workers are arriving from Chicago, California and even Puerto Rico and Latin American countries for those jobs, but there still aren’t enough to fill every open position. As a result, builders find themselves paying more to attract workers and taking longer to complete some projects. “I’ve seen as much as a one-third increase” in the wages required to hire workers in some skilled trades, says Bruce McNeilage, a principal in Kinloch Homes, Harpeth Development and Cumberland Real Estate Development. He is the developer behind Solo East and Solo Lofts condos in Nashville. “The problem is, if you say, ‘no,’ they go to the next guy. These guys are capitalists, which is good,” he says. A house that usually takes 90 days to build can take 120 now, McNeilage adds. That is, if you can find someone to do the work. “You drive down some streets in East Nashville and see houses under construction, and nobody’s there,” he acknowledges. The labor market could get even tighter. More than half of the nation’s highway construction workforce is over 45 years old, and the U.S. Department of Transportation predicted that a half-million jobs would need to be filled over the next decade. That was before President Trump proposed spending up to $1 trillion on infrastructure over the next 10 years, which Georgetown University’s Center on Education and the Workforce estimated would create more than 11 million jobs. Rodney Reese, left, and Devin Johnson with Mid-South Scaffold Construction try to lift a pallet with no success, opting instead to wait for a forklift. They are working at the $430 million Fifth + Broadway, a 34- and 26-story mixed-use development on the site of the city’s old convention center. “Where will you get bulldozer operators?” asks David McGowan, president of Regent Homes, which builds houses and condos in the Nashville region. McGowan also is part of the leadership of Go Build Tennessee, a not-for-profit organization created by home builders, road builders and the commercial construction industry to encourage young people to consider careers in the skilled trades. “A bulldozer operator can make $65,000 a year,” McGowan points out. “A really good one can make $80,000. A good building superintendent can make $75,000 to $80,000. Two years ago, that would have been $40,000 to $50,000. The labor shortfall is not a crisis, he says. But it is affecting the pace of work. “We sometimes wait two or three weeks to get a plumber on the job. Imagine all the work in downtown Nashville. If you have a small suburban job, you have to fight for that labor,” McGowan adds. Contractors working on large projects can face similar difficulties. “It’s a battle every day,” says David Stansell, CEO of Stansell Electric Co. He is also president of Go Build Tennessee. “You can walk off the job you have in construction today and get a raise,” he says. The industry looked into the future and realized it needed to take action. 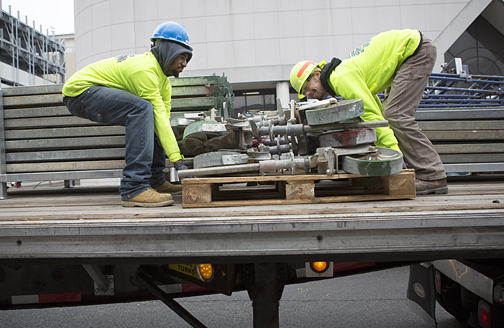 The workforce is graying, with an average age of 47 in the skilled trades. It’s also shrinking slowly. For every five tradespeople who retire, one man or woman replaces them. 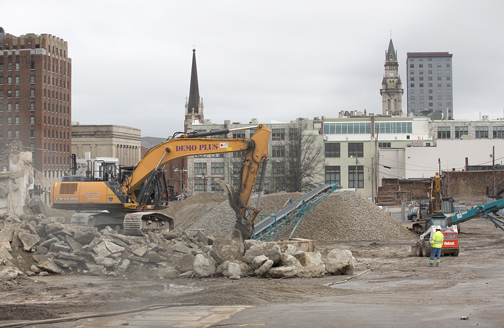 Site preparation is underway for the $194M federal courthouse at Church Street and Rosa Parks Blvd. Then there’s competition from outside the construction and roadbuilding industries for skilled employees. Once all the high-rises under construction are occupied by hotels and offices, they need electricians, plumbers and others to manage their systems. And those jobs are indoors, out of the weather, and may offer 40-hour work weeks. “When you’re driving down the interstate you wonder why it takes so long to fix that road. 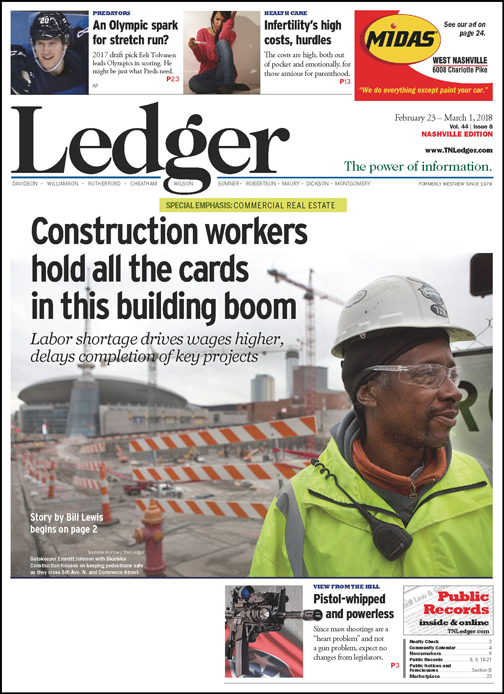 The skilled labor shortage affects everything across the board,” McGowan explains. Go Build Tennessee, now in its third year, is funded by licensing fees that contractors pay to the state. The organization works with educators and has an active presence on social media. Its Facebook page has had more than 515,000 views, and the organization has distributed more than 170,000 “Go Build Tool Kits” to schools. Go Build Tennessee also holds events like the recent “touch a truck” day at Nashville’s Adventure Science Center featuring heavy equipment manufacturers Caterpillar and John Deere as well as Nashville Electric Service. The construction industry in Middle Tennessee actively recruits workers in other regions, particularly California, Florida and the Midwest. It also has a relationship with 4:13 Strong, a Nashville nonprofit that helps men who have been in jail learn the life and work skills they need to turn their lives around. Other recruits come from Latin America and Puerto Rico, but that has slowed a bit since the island was devastated by Hurricane Irma last September. “They come in crews of six to 20. You hire the whole crew,” says Jon White vice president of talent for Stansell Electric Co.